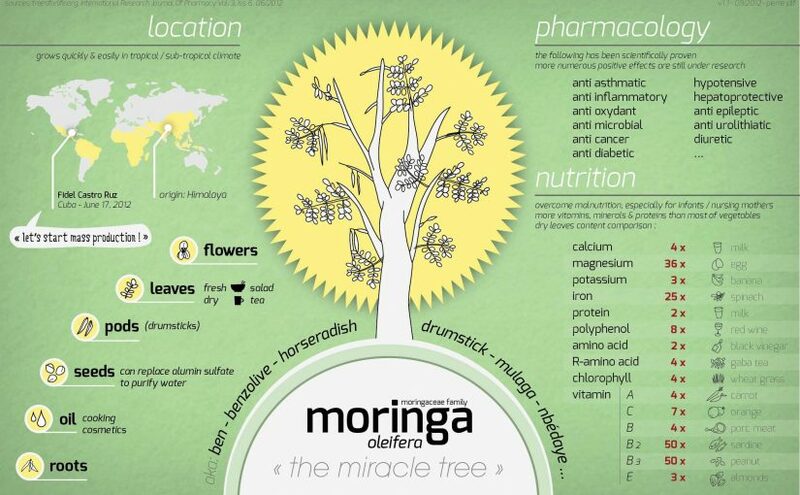 Hailed as the world’s newest superfood and charged with high levels of nutrition, the moringa tree is being referred to as the “Miracle Tree”. It’s the new kid on the superfood block and is packed with medicinal value and benefits which are purifying and detoxifying. Moringa Oleifera is a plant that is native to the Himalayas, but is also prevalent in Africa, Central and South America, and parts of Asia. It is also known as the “horseradish tree”, as the roots are similar in taste to its namesake. It is called shigru in Ayurvedic medicine and Jacinto in Spanish. The moringa tree’s nutritional profile contains nine essential amino acids with a plethora of polyphenols, phenolic acids and flavonoids which are essential for the body to function well. It has a level of protein usually only found in animal protein, and multiple vitamins and minerals. Almost all of the tree is consumable, including its bark, roots and flowers. The benefits of this plant are numerous for both human and animals and include the ability to kill bacteria and harmful parasites, help control diabetes, regulate blood pressure and calm inflammation within the body. It possesses more vitamin C than an orange, controls free radicals and assists with in utero development. It has more vitamin B3 than peanuts, more vitamin A than carrots, more fibre than oats, and up to 25 times more iron that is found in spinach, making it a natural multi vitamin and tool for the body’s general health. Not only does it produce incredible health related benefits, but it is also responsible for the decline in poverty and malnutrition in the worlds poorer nations. The moringa tree is extremely hardy and grows rapidly in harsh environments where other plants struggle to survive and will grow to over three metres in height, making this an ideal solution to the malnutrition problems that hot and arid nations face. A recent initiative has been introduced where farmers in Ghana and other African and Asian countries are being taught to cultivate and produce edible consumables from the plant that they can eat and produce other consumables which they sell to a guaranteed market. This is enhancing both the health and wealth of these communities, where around three million deaths per year occur due to a lack of nutrition for children under the age of five. As more consumers are becoming aware of the benefits of moringa, health food and online distributors are quickly catching on and buying in stock. As well as tablet form, there are health bars, powder and energy drinks available. The powder can conveniently be made into a smoothie or even mixed into cereals to give an extra boost in the mornings.